Get Empowered for the Holidays! Looking for gifts that will inspire? 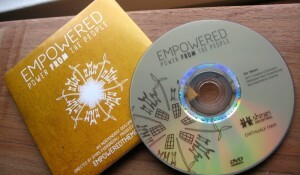 How about getting copies of Empowered for your friends and family? We are now offering special deals for bulk purchases. Be sure to place your orders in time for holiday delivery. The DVD comes with special features including deleted scenes and highlights from the panel discussion at our premiere! Order DVDs and more through our online store! Since we’re environmentalists, we don’t really like making products and shipping things around – we prefer things to be done online when possible. But we’ve had a lot of requests for the DVD, and they are useful for community screenings and gifts. So, we’re now selling DVDs! They’re made in as low-impact a way as we can manage, burned right here at Shirari Industries (a.k.a. the director’s living room), and folded into handmade paper packets (no plastic cases). Proceeds go toward making more DVDs, creating outreach materials, maintaining this website, and funding other upcoming film and activist projects.